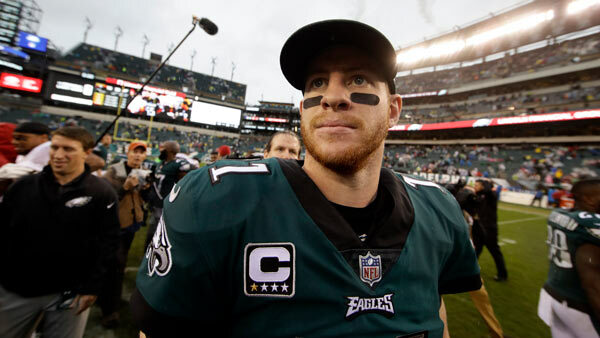 PHILADELPHIA (WPVI) -- Philadelphia Eagles quarterback Carson Wentz has been named the NFC Offensive Player of the Month. The NFL made the announcement on Thursday. Carson Wentz Wins NFC offensive player of the month! A week ago, Wentz won the NFC Offensive Player of the Week award. Wentz threw 14 touchdown passes in October, the most in a calendar month in team history. October's NFC Offensive Player of the Month. On Wednesday, Eagles cornerback Jalen Mills was named NFC Defensive Player of the Week. The Eagles are 7-1 and will meet the Denver Broncos Sunday at Lincoln Financial Field.